Get started with i-School Management ERP. Our Prices start only at SGD35.00/ RM105.00 monthly for unlimited students, unlimited courses, custom branding and FREE hosting. We promise you will be amazed! Simple & easy to use. All school functions on web and mobile devices. Native mobile apps link with school database and custom branding. Invoicing Modules with cash/paypal online payment. All data stored are encrypted and are totally secure & safe. Data are also having multiple redundancy and disaster recovery processes to ensure accessibility. As a teacher, parent or student, you can work on it from anywhere. Students can access their study material anywhere while teachers can look up lesson plans while on their mobile. No fixed installation or infrastructure is required, apart from a smart phone and a reliable internet connection. Students and teachers can have e-discussions while preparing for their exams and get their problems resolved. Without automation, attendance was monitored by way of roll call, a chore that took minutes to complete. 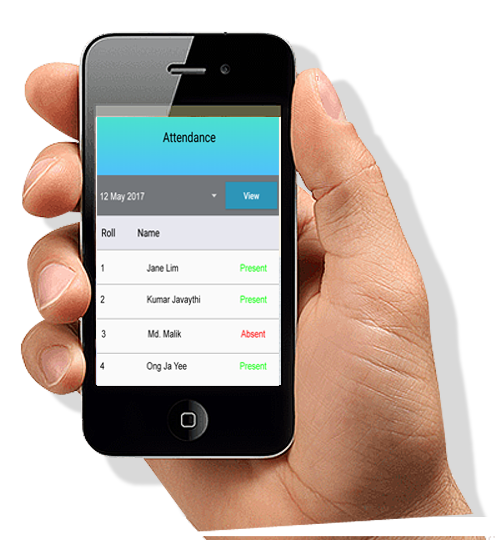 With the biometric devices, attendance is marked automatically and a notification is sent to all parents whose children are absent. This ensures that the parents are aware that their child is absent from school. A school management system can brings together teachers, parents, principals and students together. This in turns builds a strong school community by involving all the stakeholders in group discussions and engaging activities. The beauty of i-school management software is that it can be customized according to each school’s unique needs This means that you can get the system such that it recognizes your process flow and functions accordingly. It can also be tweaked according to the changing requirements of the school. Teachers can upload study material anytime, anywhere. They can also check the students’ performance reports, their homework and do a performance analysis. Like wise for students, they have access to study material at all times and check their class schedules in advance. The online library catalog will allow them to reserve or renew book anytime. Students can also interact with teachers and each other to revise and clarify doubts. Parents are kept inform of what is happening in the school via online newsletters and circulars as well as message alerts. User friendly – No expertise knowledge is required to get you started. With little training on how to use the software you are good to go. Paperless society ~ Instead of using pen and paper, use apps and smart phones, a much smarter and less troublesome way of working. Information is now literally at the tips of your finger. Save $10 every year compared to the monthly plan by paying yearly. Include all enterprise features with attendance biometric module integration.